PEC (Punjab Examination Commission, Pakistan) has announced the results of 5th and 8th Class. Results of Class 5 and 8 for the students of Attock, Bahawalnagar, Bahawalpur, Bhakkar, Chakwal, Chiniot, DG Khan, Faisabad, Gujranwala, Gujrat, Hafizabad, Jhelum, Jhang, Kasur, Khanewal, Khushab, Lahore, Layyah, Lodhran, M.B. Din, Mianwali, Multan, Muzaffargarh, Nankana Sahib, Narowal, Okara, Pak Pattan, Rahim Yar Khan, Rajanpur, Rawalpindi, Sahiwal, Sargodha, Sheikhupura, Sialkot, Toba Tek Singh and Vehari are announced. 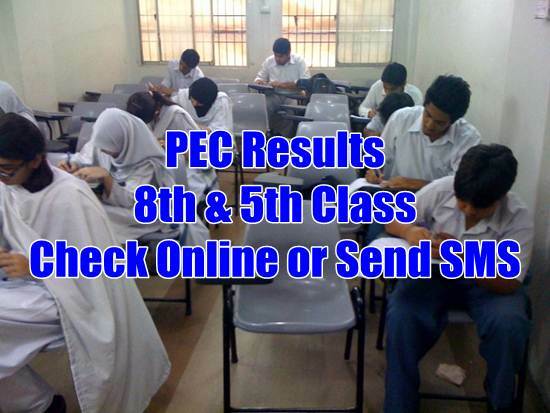 Results can be checked online from official website of PEC at following URL. You can check results by sending roll number of the student to 800222. Students study all the year, they work hard for the better results in the examinations. At the end of their academic session they prepare for the final papers and appear in the exams. In Punjab, PEC conducts board papers for classes 8 and 5. PEC declares results of these classes on 31 March each year. Now when students are anxious to get their results, we have written this informative post for them so that students and their parents can know the results without any hassle. We wish best of luck to all of you.